Drew Goddard and Ridley Scott come together to bring you the coolest heartfelt space drama since Christopher Nolan's "Interstellar"! Drew Goddard's phenomenal writing stems from Andy Weir the author of the actual book the film is based on. Yet while it's written for the screen it feels original and refreshing. Ridley Scott in my opinion hasn't given up yet. He has tons of fight left in him. He just needs a good writer because his directing is flawless. "The Martian" has an ensemble cast consisting of Matt Damon in the lead role, as well as Jessica Chastain, Michael Pena, Sebastian Stan, Jeff Daniels, Kate Mara, Chiwetel Ejiofor and Kristen Wiig who all come together to give us a riveting performance comparable to Ron Howard's "Apollo 13". The plot follows Matt Damon as Commander Mark Watney who during a routine expedition gets separated from his crew during a storm and stranded on Mars alone. That's about all that needs to be said for "The Martian" and its plot. And even though you might think you know where this is going based on the trailer or just a plain thought you'll be happy to know that this film is anything but predictable. Before jumping into what dazzled me I would like to touch on the fact that I don't think this is going to secure a nomination at the 2015 "Academy Awards". The performances were fantastic but in a way that just leaves you saying this was worth my money and time but I don't think it hits everything I needed it to hit for an "Oscar" film. 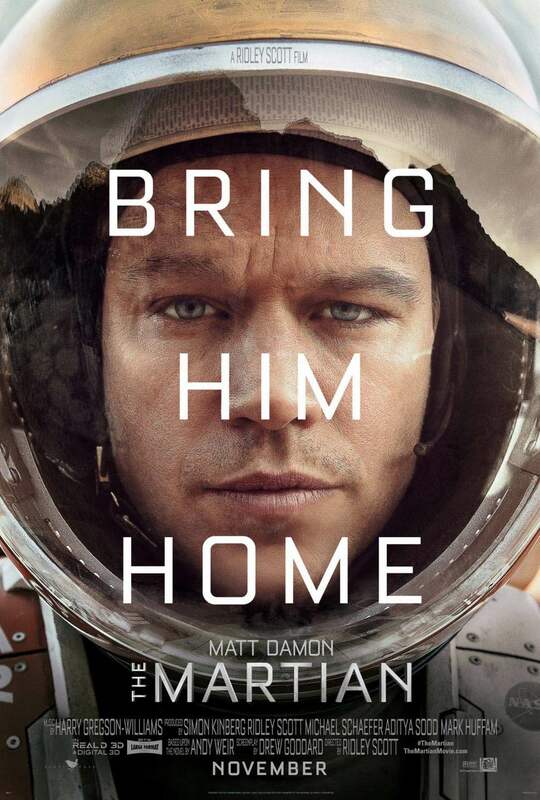 Damon alone stranded on Mars has every opportunity to turn his dramatic performance skills up a notch yet he clearly decides to stay in his safe zone. Which is okay but I was hoping that Ridley would use him in a different way. Maybe travel down the psychological route after being stranded and it gets worse and worse yet none of that is shown here. 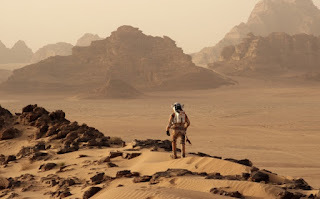 On the other hand Damon while staying in his safe zone gives us a realistic interpretation of what it would be like to have a botanist who works for "N.A.S.A" stuck on mars. The ideas that Damon's character comes up with to ration his goods is brilliant and as I stated before I think Drew Goddard really took the essence of Andy Weirs novel which felt like it was made for much older space travel technology and kicked it up a notch. 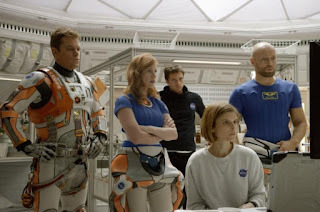 Chastain, Pena, Mara, Stan and Hennie are Mark's crew members who after leaving mars are on a 10 month trip back home, supporting Damon's performance these 5 actors nailed it with a natural performance. All in all you can see the gritty feel of a Ridley Scott film with the style, camera and editing he normally uses. The score of the film is nothing to run home about but it sure does keep your spirits up in the tone of the film and keeps you wanting to finish the story. Overall I think that this film surprised me the most, judging by the marketing I saw for the film, I was not impressed. And then to find out Ridley Scott was directing after his track record recently had me worried as well, yet Scott proved me wrong here thanks to a marriage of good writing and directing. 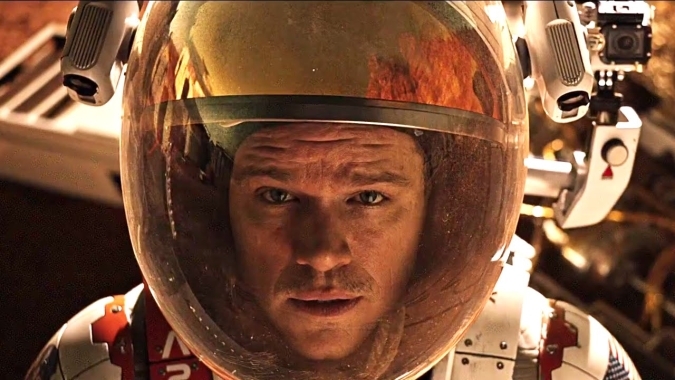 In closing while the film has those performance boundaries, I thought "The Martian" was a great film, definitely one of the more enjoyable experiences I've had in a theater this year, but sadly it falls below the "Oscar" bar and the race has already started thanks to Scott Coopers "Black Mass".